It is SNOW WEEK and we are still knee deep in snow themed toddler activities! Snowman toss games are always HUGE hits around here because they get kids moving and are easy to set up. They also involve throwing things in the house, which my kids always love! In addition to toss games, our snowball number race is another fun way to get kids moving. 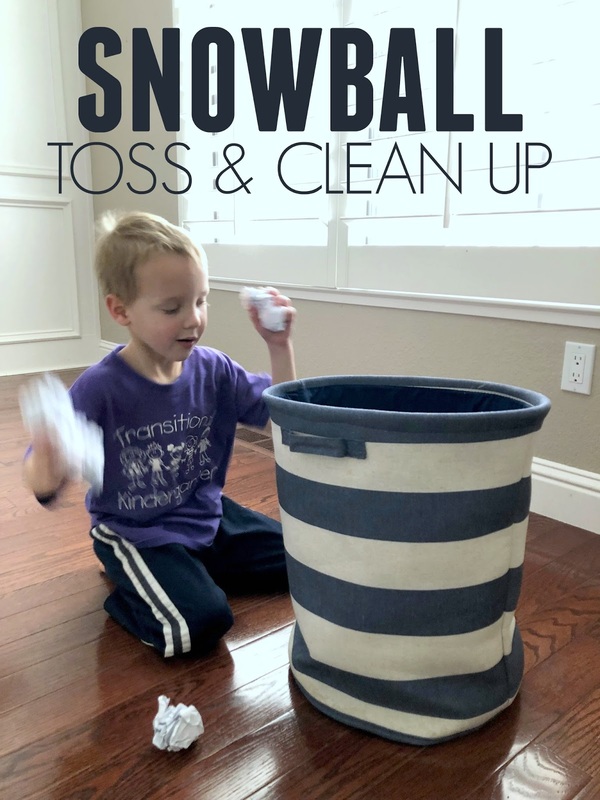 Today we opted for an even easier snowball toss and clean up game! I told you it was easy to set up! To play, first you need to make a big pile of snowballs using computer paper. Thinner paper is easier to scrunch. My kids had fun making these. The toddler preferred to watch while the preschooler turned them into balls... and then the toddler grabbed them and ran off with them. Once we had a big pile of snowballs, we had a snowball fight. The kids threw balls at each other and me and we just giggled and giggles. After we played, we gathered the balls and played again! Once we got tired of snowball fighting, we grabbed a laundry hamper and practiced tossing the snowballs into the laundry hamper. The kids slam dunked, shot from far away, and came up super close to shoot. Once all of the snowballs were in the hamper, the toddler loved to turn it over and dump everything out. We played this again and again and again! The preschooler was especially excited to practice aiming into the hamper and also see how many snowballs he could throw at one time! I was pretty impressed to see how many he could hold at one time! I love this simple activity because it didn't take much prep and the kids got some good energy out! I always love finding a quick activity that can fill time between lunch and naptime while we are waiting for my bigger kids to get home. If you have any other favorite quick movement time fillers, please send them along! Make sure you check out the other snow themed activities below from our Virtual Book Club for Kids snow week HERE in our Snowy Day Sticky Table post.